Address: No. 08 Ngoc Khanh st ., Ba Dinh Dist, Hanoi, Vietnam (new no.25). 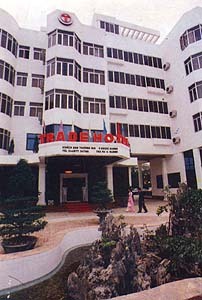 The hotel is located in a thriving hub of Hanoi. It is just a short walk to Ngoc Khanh Lake, Giang Vo Lake and Giang Vo Exhibition Centre. Room: There are a total of 50 units, comprising one-bedroom to three-bedroom serviced apartments All units are purpose - built and luxuriously furnished by renowned international designers. Trade Hotel will serve and meet all guest - requirements and we hope that you will consider here as your family. Airport pick-up: US$ 18/way for a 4 seats car; US$22/way/7seats and US$25/way/16seats van. All rates are in USD, 10% VAT & 5% service charges. Add US$ 15/night/person more for an extra bed.